Pinal County's population surged more than 100 percent in the last decade, but growth in the rest of the state paled by comparison and came up far short of expectations, new U.S. census figures showed Thursday. Pima County's population possibly did not reach 1 million and grew at a rate of only 16 percent between 2000 and 2010, compared with Pinal County's 109 percent and Maricopa County's 24 percent rate. That means the Tucson area isn't likely to get a piece of the state's new congressional district, and could lose one of its five legislative districts. Compared to the boom years of the 1990s, growth rates in Pima County and statewide slowed dramatically. In fact, population may even have dropped in Pima and Maricopa counties in the past few years, in part because of the economic bust, experts said. Meanwhile, the Hispanic population grew by 46 percent statewide over the last decade - more than twice the growth of all other ethnic groups - according to the new census figures. Hispanics make up nearly 30 percent of Arizona's nearly 6.4 million residents, or almost 1.9 million residents. "There is a demographic change in Arizona and it's going to continue," said U.S. Rep. Raúl Grijalva, a Democrat who represents parts of Tucson, Santa Cruz County and southwest Arizona. "The implications for the state Legislature and the governor is that they have to make some accommodations with this growth or continue to alienate the population that is such a large part of Arizona. You can either be farsighted or shortsighted. I hope they choose wisely." The Hispanic population growth in the past decade can be traced in part to Hispanics' historically higher-than-average birth rates and the strong family ties that Hispanics have in this area, said University of Arizona economist Alberta Charney. Even so, the state's Hispanic population is also below what had been anticipated in earlier census estimates. Some observers wonder how much the recession and the state's focus on reducing illegal immigration affected the 2010 numbers. Pima County Democratic Chairman Jeff Rogers, for example, suggested that had the earlier trend line remained, there might have even two, rather than one, additional congressional districts. He chalked the stutter up in part to "anti-immigrant sentiments" that started with Arizona's decision to sanction employers who knowingly hire illegal immigrants, and continued through the wide-ranging immigration law known as SB 1070. But John Logan, director of the U.S. 2010 Census Project and a sociology professor at Brown University, said he did not see any negative backlash from the Hispanic population within the Arizona numbers. There was a similar, healthy growth pattern in both the over-18 and under-18 groups. That tells him, he said, that young families stayed in Arizona. What he's more intrigued with, he said, is residential patterns in the new numbers that show a continuing segregation of Hispanic communities. Take, for example, Congressional District 7, represented by Grijalva, where Hispanics make up 480,000 of the district's 855,000 residents. By contrast, U.S. Rep. Gabrielle Giffords' Southeastern Arizona district has 171,000 Hispanics out of more than 750,000 people. Logan said housing costs play a role in where Hispanics, particularly first-generation immigrants, tend to settle. In addition, he said, Hispanics tend to cluster together because it's easier for them to find connections to jobs or products they need, and to live around other Spanish speakers. There are implications of that segregation, he said, including the impact on schools, which are likely to show stronger enrollment growth in Latino neighborhoods. Lea Marquez Peterson, president of the Hispanic Chamber of Commerce in Tucson, said she wasn't surprised by the census numbers, which she said just confirm the Latino community will be an increasingly important economic and political force in Arizona. With the Hispanic population tending to trend young, and with Latina-owned businesses the fastest-growing demographic, companies and politicians are going to have to be more culturally aware of the community, she said. Charney, the UA economist, said it's hard to tell how much illegal immigration played in the high Hispanic population-growth rate, "because the census counts bodies where they find them. They don't ask citizenship questions." However, Tom Rex, an Arizona State University economist, said he believes that at least some of the Hispanic increase was due to illegal immigration. "We did get a disproportionate share" of illegal immigrants until the passage of the employer sanctions act and SB 1070, Rex said, "mostly because we were growing so fast. They were coming here for one reason only, and that was jobs. Arizona was one of the fastest-growing states and this was a natural destination." 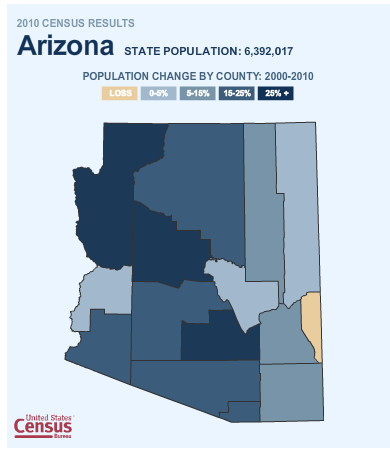 Rex was one of several population experts who felt that the lower-than-expected 2010 census counts for Pima County and most of Arizona were due both to overoptimistic estimates and to a possible decline in population in the last few years. If there was a recent population drop, Rex fingered the declining job market as the number one cause, since the state lost about 300,000 jobs in the recession. Rex said the economic decline is reflected in the sharply slower growth rates for most counties and the state as a whole for the 2000s compared to the 1990s. Pima County, for instance, grew by 26 percent in the 1990s - 10 percentage points more than in the 2000s. Maricopa County's growth rate plunged from 44 percent in the 1990s to 24 percent in the 2000s. "Arizona normally grows very quickly, mostly due to migration into the state. The people come for jobs," said Rex. "When the jobs aren't here, the people can't come. More than that, we were one of the couple states in the country that were hardest hit." David Taylor, a retired city of Tucson planner, said that although there's been no formal analysis yet, he believes that it's most likely there were some population declines in Pima County and the state in recent years. One reason he thinks so: The estimates have never been as far off as they were this time around, Taylor said. Pima County's 2010 census population of 980,263 people, for instance, was 40,000 fewer than the most recent census estimate in 2009 of about 1.022 million. Maricopa's census population of 3.817 million was more than 250,000 below estimates. But James Chang, a senior demographer for the state, said the past counts relied heavily on new-home construction statistics and there was no good way to adjust those figures to account for foreclosures and rising vacancy rates. He said it's very possible that there never were a million people living in Pima County. Brian Miller, head of the Pima County Republican Party, said the numbers only confirm why he's made outreach to the Hispanic community a key part of his growth plan for the local party. But he said that overall, local government officials bear some responsibility for the slow growth rate, saying their policies chill entrepreneurial growth. Although Tucson remains the second-most populous city in the state, with 520,000 residents, that's only one-third as large as Phoenix, and the East Valley city of Mesa is sneaking up on Tucson, with 440,000 residents. Chandler is half Tucson's size, at 236,000 people, but it grew at a rate of 34 percent. Tucson's growth rate was 6.9 percent. "Why would businesses come here?" Miller asked. "You've gotta make an enticing environment for business and right now, that environment is in Maricopa County. All these problems people complain about, from a lack of funding for education and other services, well, if we had a healthy tax base, we'd be able to support it." UA political science professor Tom Volgy, however, sees it differently. It's not surprising that Pinal County grew astronomically, he said, because it had plenty of room to do so. Maricopa County has always emphasized growth. "Frankly, it would be difficult for us to grow a heck of a lot more without destroying who we are," he said of the Tucson area. That comes with a tradeoff, Volgy acknowledged. The trend of statewide candidates hailing from Maricopa County - including offices such as U.S. Senate and governor - will likely continue, he said. Democratic Chairman Rogers said that's going to affect rural areas, too. "We're just going to see more and more clout go to the Phoenix metro area," he said, saying he wouldn't be surprised to see the number of Pima County legislative districts drop. The release of the numbers will allow the state's independent redistricting commission to begin redrawing the state's political boundaries. With congressional districts essentially supposed to cover 710,000 people, Congressional Districts 2 and 6, on opposite sides of the Phoenix area, are too populous, as is Grijalva's 7, suggesting the new district is likely to pull from 2 and 6. That process is going to determine who wins and loses in the political arena. To contact reporters: Rhonda Bodfield, rbodfield@azstarnet.com or 573-4243; Tony Davis, tdavis@azstarnet.com or 806-7746.